Efforts to preserve this cradle of Mayan civilization began in 1990 and continue today thanks to the efforts of local conservation organizations and NGOs that participate in tourism as not only an economic livelihood, but in order to preserve and manage the land. Last summer, three students from the College of Food, Agriculture, and Environmental Sciences (CFAES) visited the region and discovered another group who want to see the reserve and the communities that surround the reserve continue to exist: American and European tourists. 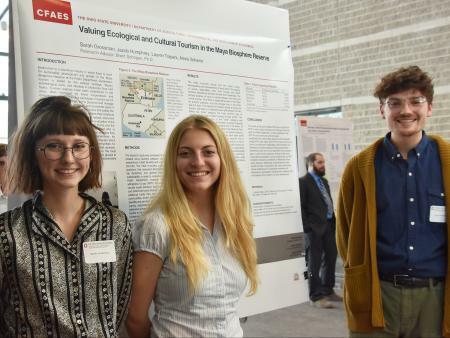 Over the course of one month, Environment, Economy, Development and Sustainability (EEDS) majors Sarah Grossman, Jacob Humphrey and Lauren Trapani surveyed over 1,000 visitors to the region using a tablet device to gather their responses. They honed in on visitors to the Island of Flores/la Isla de Flores and Tikal National Park. 90% of tourists coming to the region visit that area which spans 220 square miles of jungle and archeological ruins. Their goal was to understand who comes to the region and why, how long they stay, what ecotourism activities are of interest and what if any, sustainable initiatives these tourists would be willing to support. They found that the majority of the visitors to the region hailed from Europe and America, where efforts and initiatives around sustainability have been widely adopted. Of those surveyed, 70% indicated that sustainability and ecotourism were either ‘very important’ or extremely’ important when planning their travels. In talking with the locals, the students found them at first, a bit suspicious of their motives. To them, sustainability was a western issue and initiatives to save the earth and their livelihoods not as pressing as their need to be more autonomous from the government and have more control over cost and fairness when it comes to paying for their electricity. When the students shared that their collected data would be provided to the local tourism agencies, businesses, and conservation groups, they saw the benefit of tourists supporting sustainability efforts, which could translate to positively and monetarily affect their lives and communities. Like supplying funds for them to harness solutions like renewable energy. After the completion of the first survey, the students then reached out via email to the initial survey respondents and asked them to pick which preferences they would support via direct payment during a trip to the region trip to support programs to better life for residents. These results showed that tourists to the region were willing to pay for sustainable efforts to take hold in the form of direct payments to communities for providing tourism amenities and environmental services. Lauren Trapani summarized the findings saying that the respondents rated their preferences from five randomized variations and the results indicated high willingness to pay (WTP) if the extra cost benefited the community and supported ecological benefits/services such as park upkeep and conservation programs. The students envision their data informing policy decisions for the region and say that their study fills a gap in existing research literature. “Ours is the only study that has asked about direct payments to communities,” says Grossman. They plan to submit their research to the Journal of Sustainable Tourism this spring. Dr. Sohngen has been conducting forestry and community concession research in the area since the 1990’s and is thrilled to see undergraduate students doing research with real-world impacts. Trapani shared that not many people, including her own family, understand environmental economics. A pitch they hope will change the course of conservation and sustainability in a region they have come to love.